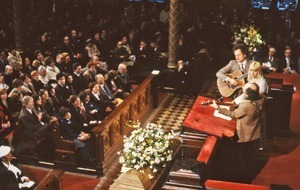 New York (N.Y.) - Peter, Mary, and Harry Chapin singing at the pulpit of Central Synagogue, NYC, during the funeral of Allard Lowenstein. 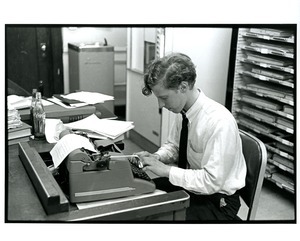 Student using a typewriter in the Harvard Crimson newsroom. 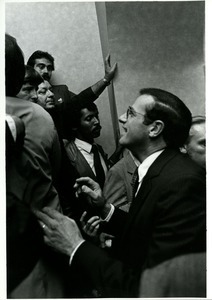 Alfred DelBello, newly elected New York State Lieutenant Governor, at Mario Cuomo's gubernatorial victory party. 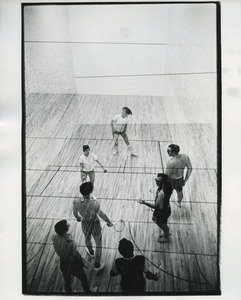 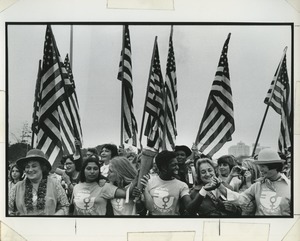 Carrying the torch to the Albert Thomas Convention Hall in Houston, Texas for the First National Women's Conference are (left to right) Bella Abzug, Sylvia Ortiz, Peggy Kokernot, Michelle Cearcy, and Betty Friedan.